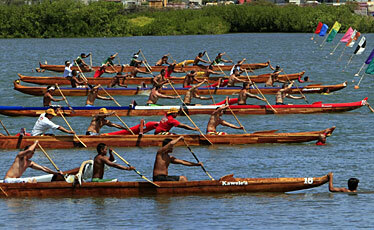 Canoes in the men's senior race stood ready during the John D. Kaupiko Regatta yesterday. By its coach's own estimate, Lanikai Canoe Club had its worst showing of the 2008 Oahu Hawaiian Canoe Racing Association season at yesterday's John D. Kaupiko Regatta at Keehi Lagoon. Despite that, Lanikai captured a modest 10 of 39 events and pulled away with 99 points to thump all comers in the AAA (largest-size) division. Kailua posed the biggest challenge with 77 as runner-up. Coach Tom Conner has about 30 crews locked into lane berths for the Hawaiian Canoe Racing Association State Championships on Aug. 2, but he was hopeful at the start of the day that two more crews, the 13 and 15 girls, would put themselves in good position for states with wins. That didn't happen, and to Conner's dismay, two other crews had to forfeit yesterday because of burying a flag and finishing in the wrong lane. Another had to scratch because of a lack of complete crew. He hopes to get those problems eliminated for the OHCRA Championships next Sunday before the regatta that counts the most. "We just have to maintain and not get derailed next week," Conner said. "As many crews that have the No. 1 seed, keep them at that level (for the best possible lane in states). We don't want to just fall off the map." Hui Lanakila captured the AA (middle-size) class title with 25 points over Leeward Kai's 14, while A (smallest-size) clubs Anuenue and Pu'uloa Outrigger took what they could get with one point each to lead their division. Keahiakahoe Canoe Club has things all figured out at exactly the right time. For the first time this Oahu Hawaiian Canoe Racing Association season, the club won its two signature events - the mixed men and women and the men's open 4 - on the same day at yesterday's John D. Kaupiko Regatta at Keehi Lagoon. Six clubs - Lanikai, Kailua, Anuenue, Outrigger, Healani, and Keahiakahoe - are in realistic contention for four state berths in the mixed men and women event for the Aug. 2 Hawaiian Canoe Racing Association State Championships. With little margin for error and only one other OHCRA regatta remaining, a win yesterday meant a huge boost going into the final week of league competition. A last-minute change banishing Keahiakahoe to the outside lane in the lagoon could have been an easy excuse to throw in the towel. But the club paddled that much harder to counter the harsher current and wind to capture the final event of the day in 4 minutes, 0.7 seconds. "We just tried to paddle as hard as we could and let the chips fall where they may," coach Kamuela Lau said. Lanikai, with a runner-up finish in the mixed event, maintained the overall lead in that race for the top OHCRA seed in states at 42 points. Keahiakahoe, Kailua, and Anuenue were deadlocked at 41. Keahiakahoe moved into third place overall in the men's open 4 event with its win yesterday and Hui Lanakila's disqualification. Lau figured out the correct combination in splitting up the club's seven primary men paddlers between their two important races. He paddled to victory in the men's open 4, and left the veteran team of Ikaika Rogerson, Jace Faufata, Ty Fu, Melissa Matsuda, Kerri Kahapea-Aqino and Jayna Kapono to handle the mixed race. "It was really huge," Lau said. "Both events we went in fourth in the standings, so we split up the seven. It just worked out well that we won both. I don't know if we can do as well as we did today (next week)." In last year's OHCRA State Championships, Keahiakahoe took fourth place in the mixed men and women - tops among OHCRA clubs - and placed third in the men's open 4. Rogerson, who has been with the Kahaluu-based club with Lau since its founding in 1995, figures next week is no time to let up with the momentum in hand. "I think with today's win we should almost be guaranteed a (top-four) seed," he said. "Oh, definitely have to compete hard next week. If we huli or if something happens out there, then we can go right back down to 0." A big part of the success of both crews has been 22-year-old steersman Ty Fu, who is considered a savant of the water by his coach. "(Ty) has been paddling for me since he was like 7," Lau said. "It's been a pleasure - he's an all-around water man, surfer, and works in Kaneohe Bay as a boat driver. It's good having his knowledge, as young as he is. And that's pretty cool." Fu knows he's by far the youngest paddler out there, but feels little to no pressure as a club member who paddled with veterans since he was 11. Fu represents the mission that the 31-year-olds Lau and Rogerson want to impart with their club. "For most of us that have been with the club as long as we have, we started off as the kids and the adults gave to us," Rogerson said. "As the adults now it's our turn to give back to the club, the kids and the community." The Waikiki Beach Boys easily won the AA Division of its own regatta, outscoring Na Keiki O Ka Mo'i 64-46 in the only surf race of the Hui Wa'a season. Kaneohe won eight of the first nine youth races en route to 94 points and the overall regatta title at Waikiki Beach. Manu O Ke Kai and Ka Mamalahoe shared the A title with 30 points.